Richardson is now the chief of naval operations (CNO), the senior four-star admiral leading the U.S. Navy. This position places him on the Joint Chiefs of Staff as adviser to the secretary of defense and the president. He draws on his deep ties to academe to help the Navy keep pace. From his graduate student days to today what has remained unchanged are the depth of his attachment to MIT and the warmth and respect between Richardson and his mentors in the MIT-Woods Hole Oceanographic Institution Joint Program. “As a graduate student, John clearly stood out as brilliant, a leader, and wonderfully warm and friendly,” says Alan Oppenheim, an MIT Ford Professor of Engineering. After his time at MIT and Woods Hole, Richardson went on to command the submarine USS Honolulu, a ship known in the Navy for the important missions for which it was tasked. Before that command he was posted at the White House as President Clinton’s Navy adviser. Just before being selected to be the CNO he was in charge of all of the nuclear reactor technology in the Navy. “It is so striking that through his ascendancy in the Navy, John never lost these professional and personal qualities. He is as approachable today as he was back then,” Oppenheim says. 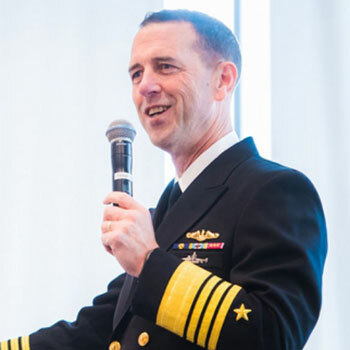 Richardson insists other alumni have made what he describes as “far more important contributions to the field of engineering.” And says for his part, he’s been able to apply his time at MIT to leading the Navy. “All of that anxiety was instantly dispelled by the love and respect Al engenders in others, and that will always be part of his legacy. We all felt like family by our association with him and MIT,” Richardson says. Among other things, MIT has a long-standing Graduate Program in Naval Construction and Marine Engineering in close cooperation with the Navy dating back to 1901. The program prepares U.S. Navy, U.S. Coast Guard, foreign naval officers, and other graduate students for careers in ships design and construction. “The Arctic ice cap is the smallest it has been since we started taking measurements and getting smaller, and that has tremendous implications for traffic routes and access to resources,” he said. “Things are moving very quickly. It’s very competitive. We’ve done a lot of work to try and figure out — how should the Navy respond?” he said. Multiple analyses show a need for heightened naval capability. Yet even the most aggressive shipbuilding plan equates to reaching 350 ships in about 17 years. In his presentation, Richardson pointed to a chart with icons representing the U.S. fleet: ships, satellites, submarines, and aircraft. Let’s redefine the axis, he said. The measure of naval capability no longer rests only on the numerical metric of physical things but also on the ability to network platforms and to manage information. “Signal processing has a terrific and important role in helping us transcend just making more ships. We must make our ships – and our Navy – more capable as well,” said Richardson. He pointed to a new graph in which U.S. naval power rises beyond exponential curves as the fleet is deeply networked with the assistance of technologies such as artificial intelligence, human and machine teams, and quantum computing. More recently, Richardson created Task Force Ocean, which seeks to link innovative research concepts with the needs of the U.S. Navy, especially undersea forces. The senior academic involved in these Navy efforts is Arthur Baggeroer. “I have known every chief of naval operations over the last two decades, and John is by far the most engaged with academia,” says Baggeroer, who was the director of the MIT-WHOI program when Richardson enrolled in 1985. He also acted as academic advisor to Richardson and five additional naval officers in the program. Over the years, Baggeroer kept up with Richardson as he rose through the ranks. “He has been very supportive of the MIT-WHOI Joint Program and has taken steps to attract to the program younger officers with the same qualifications he had at the time,” adds Baggeroer. Richardson was, by all accounts, a star graduate student. His career track and leadership continue to inspire Navy students, says Tim Stanton, scientist emeritus at the Woods Hole Oceanographic Institution. He joined Oppenheim as Richardson’s thesis advisor.